Our Ad Exec will be with you. Our contact is 24982244. Kindly contact Mr. Santosh 9962822255 regarding Advertisement to be published for our commercial property in Whites Road. Thanks. We will do this. You may also call us at 24982244/ Mylapore Times office. For advertising call 24671122 please. Dear sir, I need to publish my education ad regarding chess class …so, can I publish it in front page ?? I want to list an apartment for sale in balajinagar.how do I do it. Can I post a rental AD online ?? I want to post a Rental AD for my house at Mylapore. Mail the advert to – mylporetimes@gmail.com. We would like to advertise Job openings in our Group of Institutes in 10 cm X 3.5 cm in Southern Edition on Sunday only. Call 2467 1122 at our office please. Open 10 am to 5.30pm. I would like to give advertisement through online. Talk to our manager at 2498 2244 / 2467 1122. We may get better look if you use separate columns for Flats/apartments & Villa/land with building in properties; it’s now mixup, difficult to differentiate in page 8. We are a traditional Yoga Institute and the direct family of T Krishnamacharya. We would like to place a free ad in your Paper and would like to know the procedure. While the weekly newspaper is circulated free on Saturdays, advertisements – Classifieds and Display – are charged for. Call 24671122 for guidance to advertise. Good morning. I want to give a classified add under Rental column for this week end. Can I release the add and make the payment online. Request for adverts must be mailed to – mylaporetimes@gmail.com. Or you may call 2498 2244. I want to advertise my online garden blog and organic store through your publication both on paper as well as website. I do have constraints on budget as this is just a start up initiative but still happy to have my advert in your publication as I know its reach being a former Mylaporean. Kindly guide me through the way forward. Thanks for the query. Our office will make contact on this. 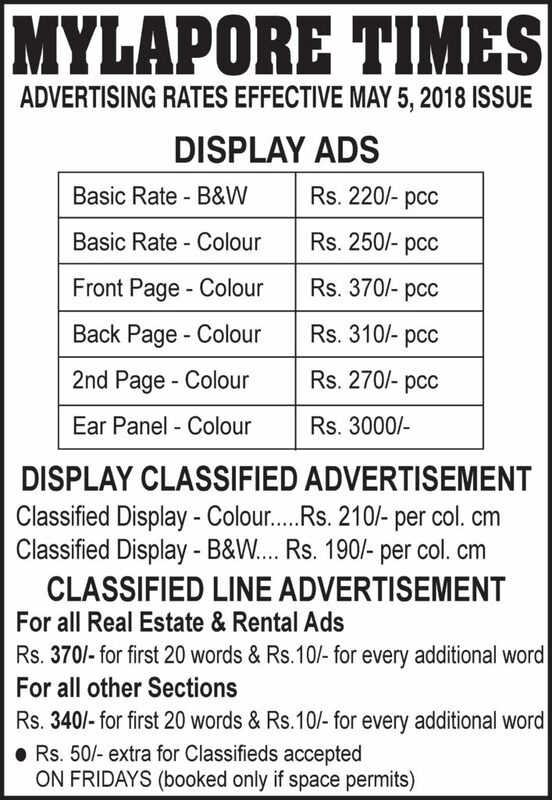 Dear Amar, please call our office at 2467 1122 in Chennai and our staff wil guide you on advertising. Booking deadline – Thurs. 9 pm. Bookings can be made on Friday by 1 pm but a late fee is charged/ MT Office. Kindly let us know the tarrif etc asap. Please call Shanthi at 24982244. Circulation of mylapor times isn’t there in RK Mutt road, Mandaveli. Please check. The Circulation Exec. has been briefed and will work on it. Thanks for the feedback. Dear Sir/ Madam…One of my friend is a very good cartoonist and drawing artist… he is capable in drawing cartoon tales on any topic and any other drawing according to the demand…is there any chance for him at our own weekly Mylapore times….That will be a great opportunity for him if that happens as the reach of Mylapore Times is very high…please let me know whom should we contact for this…. I want to give an add for my two bed Room Flat area 753 sq ft at 8/32, Devadi street, Mylapore Garden, Mylapore, Chennai 600004 in the IV floor.Lift available. Can be seen on Holidays / sundays from 3.00 pm to 5.00 pm. Pl give the add in your nest issue and I will pay the charges directly to your ac , after knowing your account details in your reply mail. Normal balck and white add . For booking adverts call 044-24982244 or mail – mylaporetimes@gmail.com. This is not the place to post advert queries! Please let me know how to pay. We would like to advertise for our guest house which is located in Thandikudi near Kodaikanal. The purpose is to rent out the guest house during this summer. Should I word the matter and send it to you. Pls advise. Want to publish a advertisement in the rental column for 1 bhk flat for rent, suited for a small family behind all india radio station, mylapore. Contact 9821049238/ 9870009238. Please let us know the charges and how to remit it as we stay in Mumbai. We circulate 30,000 copies – from Alwarpet to San Thome, Dr R K Salai to Adyar river. Discounts are given only to longtime clients. Call 24982244 to get more info. Pl mail to – mylaporetimes@gmail.com. Call our office at 24982244 – 10am to 530pm for guidance. We are one till 8pm on Thursday to book adverts.